Key Difference: A flea market is a large open-air market where people come to buy and sell a variety of goods. These goods are more commonly used or second-hand, though some people may also bring new goods to sell. These markets may also have people that sell home-made crafts or merchandise. Farmers’ Market is a retail market that allows people to sell homegrown fruits and vegetables directly to the consumer. These markets are not limited to fruits and vegetables and can also have meat, live animals, baked goods, dairy products, poultry and various other food items. 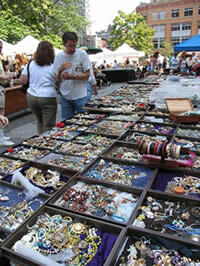 Flea market and farmers’ market are two different types of markets that take place in many countries today. Flea markets often deal with more household and non-food items, while farmers’ market deals mainly with food items. These two can often be confused as sometimes food is available at flea markets and farmers’ markets can also have non-food items. However, these are two different types of markets and should not be confused. A flee market is a large open-air market where people come to buy and sell a variety of goods. These goods are more commonly used or second-hand, though some people may also bring new goods to sell. These markets may also have people that sell home-made crafts or merchandise. Flea markets are held on large fields, conference halls, school gymnasiums, etc., where people are invited to search for bargains and deals on items. The owner of the flea market is usually the owner of the land where the market is held, who then rents out stalls or stalls spaces to people that want to sell merchandise. 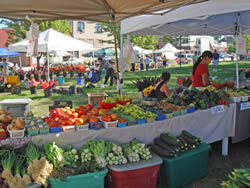 Farmers’ Market is a retail market that allows people to sell homegrown fruits and vegetables directly to the consumer. These markets are not limited to fruits and vegetables and can also have meat, live animals, baked goods, dairy products, poultry and various other food items. Farmers’ markets exist in almost all communities and add value to them, by allowing people to cut out the middle man and directly deal with the farmer. The size for such markets can range from one open field to many city blocks. Many people can also find foreign delicacies at these markets. Farmers’ Markets allow people to sell and buy organically grown food, which is why these markets are also sometimes referred to as organic markets. These foods almost cost the same or a little extra than the food found at a supermarket but many are willing to pay as it supports local farmers and they are getting fresh and uncontaminated food. Even the meat is considered to be organic and is slaughtered in a government inspected slaughterhouse. These ensure that the meat is clean and the animals are not given supplements. These markets are essentially beneficially for everyone, the farmers, the consumers and the communities. The farmers do not have to travel or cut back on the profits that are usually taken by the middle men. The consumers are getting organic and fresh foods that have travelled only a short distance. The market generates traffic for nearby business, since transportation is limited, there is less pollution and lower transportation costs. These markets can take place yearly, monthly, weekly and even daily, depending on the area.